Now only available as a complimentary .pdf download e-book. There are numerous ways to present and discuss the different aspects of flight and flight control. It is usual for a pilot to be able to fly quite well, even without an understanding of the real cause and effect of the aircraft controls. Many excellent books and articles have been written for pilots about methods and techniques for conducting safe flight, but the industry continues to have the same basic accidents and incidents. 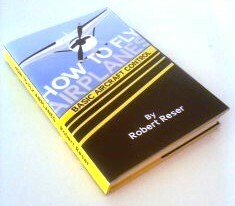 This book emphasizes understanding control and development of technique the author deems often missing in current flight training. Few pilots understand the real effects of pitch control for indicated-airspeed, engine thrust for lift, and proper control input for attitude control. All fly using the combination of controls to attain the attitudes desired. There is considerable misunderstanding of the specific result to be expected from any one control. It is a kind of re-action flight. Doing whatever gets the desired result. Action flight is flight utilizing a proper control because you know what the result will be. It is often not the incident or emergency that causes the crash. The tragedy occurs when the failure to control properly causes a stall during the following forced approach to landing. The procedures necessary for making emergency landings are not well understood, especially for private pilots. The statistics of stall crashes confirms this every day. If this book saves one life, then it was worth it! Every week in the U.S., there are accidents where pilots have made different kinds of emergency landings. Almost without fail, the accident reports describe, or suggest the incident having ended with the aircraft stalling and crashing. An emergency landing resulting in the aircraft stalling is not a landing but a crash. A stall leads to the aircraft falling. It is not flying during the period of stall. Gravity is a huge acceleration factor even when falling a few feet. The most common attitude of an inadvertent stall is landing or crashing on one wing first. Landing on a wing is not part of aircraft design. What is going on that these incidents continue to happen week after week, year after year? 1. Prior training is a significant part. All pilots are not trained how to control aircraft properly. Few pilots know where to set the elevator-pitch trim for the indicated-airspeed for landing and then leave it alone to roundout and flare. 2. The private pilots in the U.S. are not required to demonstrate any proficiency in idle-power spot landings. This is the approach required to make engine-out off-field landings. 3. The emergency landing training currently demonstrated is an approach to a chosen field with a go-around five hundred feet AGL. This does not teach final approach to touchdown procedures. 4. Proficiency in glide control for extending glide distance in ground effect is not required. 5. There is seldom teaching of “directed course” visual approach technique, to enable judgment for power-off spot landings. 6. There has never been any suggestion of how to survive touchdown to stop, and that is the most exciting part. 7. Almost every week, there are fatalities involved in crash from non-instrument rated pilots flying into weather, or in some manner becoming visually disorientated. There is an old adage for pilots…”Fly the Aircraft First”. A review of aviation accident history seems to indicate a failure to fly when dealing with real life incidents and emergencies. The aircraft "stalled and crashed” is the most common term used when describing these flights. Are we really teaching how to think in terms of landing into obstructions like rocks, trees, parking lots, etc. A person must have considered what is required to face the reality of these kinds of situations. It is not written in the books…until now.